What a great application for old wood shutters. 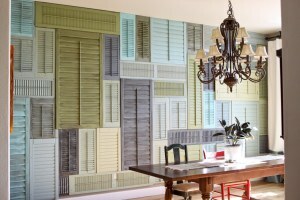 This is one of the most unconventional uses for both new and antique shutters. The homeowner recycled interior and louvered exterior shutters of various sizes, shapes, styles (plantation shutters and colonial shutters), color (painted shutters and stained shutters), and degrees of distress. Each shutter panel seems to have a story to tell and they all blend so well together. The shutters must bee wood in order for each of them to be manipulated to fit the space. I love this particular application, and have now found a way to recycle various odd or damaged shutters. Talk about creating a focal point for the room Great idea and conversation starter! We would love to see your solution for using old window shutters. Please post a picture on our All About Shutters: Facebook page. This entry was posted in Construction, Interior Shutters and tagged exterior shutters, Interior Shutters, old shutters, painted shutters, plantation shutters, reclaim shutters, recycle shutters, shutter craft, stained shutters, traditional shutters, used shutters, wood shutters. Bookmark the permalink.